VMU-900 is our new compact data logger with an integrated 50Hz GPS /100Hz IMU module that enables very accurate measurements for a variety of applications such as driver analysis, lap timing, vehicle trajectory analysis, track mapping, acceleration-decceleration and more. The VMU-900 comes with a fully configurable CAN BUS, an RS232 port, 5 inputs, 2 outputs, int. 32MB flash memory and is enclosed in a compact IP67 CNC aluminium body that weights just 80g. Also available in a basic non-logging version. A 50Hz GPS module with ultra-fast start-up time (1-3 sec) enables accurate lap-timing with section break down and raw data logging. 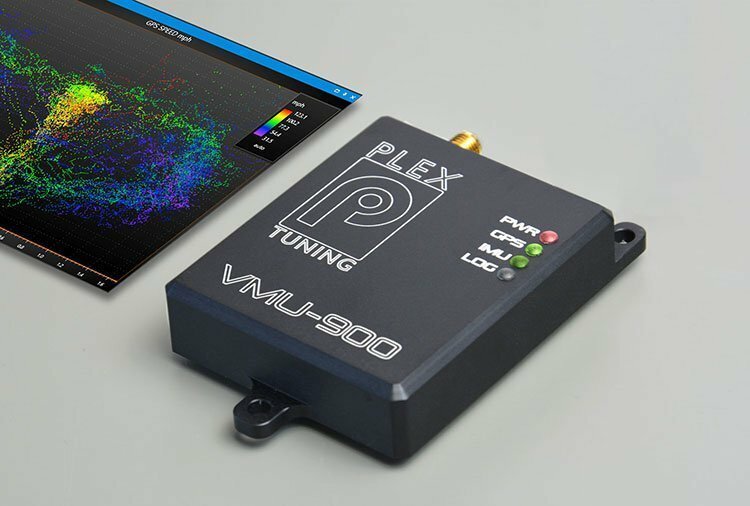 The VMU-900’s datalogging versions work with our PDA-WIN® (free) and PDA-WIN PRO® (paid) data analysis software. The new PLEX Data Analysis Software is one of the easiest, fastest and most versatile data analysis & visualisation solutions available that is meant to shape the way racers benefit from logged data by saving time & enabling smarter decision making. With an intuitive UI and ample customisation options it helps one decipher complex engine, race, driver & tuning data by visualising it in easy to interpret & compare graphs, tables and other analysis components. Sync and review you video data along with the log data to get additional information on driver performance and data context. Take advantage of the Plex Data Analysis SW and use it to analyse data from any logging system (ECUs, dedicated loggers, etc). Weighting merely 80g (55mm x 65mm x15.3mm) and being IP67 sealed, the VMU-900 is compact enough to fit conveniently anywhere you choose on your vehicle. Yet, underneath its aluminium enclosure lies a powerful and fully configurable datalogger with up to 64 data channels capacity for plug-n-play use with any after market ECU or for standalone operation whilst also offering math channels, configurable I/Os and variable logging rate. True 50Hz GPS speed with 0.1m/sec velocity, 2.5m CEP accuracy and 1sec hot start. Log GPS data on the device or send it to external devices via CAN BUS/RS232. 100Hz Inertial measurement module that combines accelerometer, gyroscope and magnetometer to report the vehicles’s specific force and angular rate (pitch, roll and yaw). 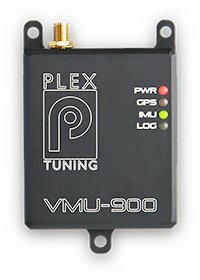 Connect the VMU-900 to our PLEX Device Manager SW for in depth configuration of the CAN BUS port, datalogging, alarms, math channels and I/Os.